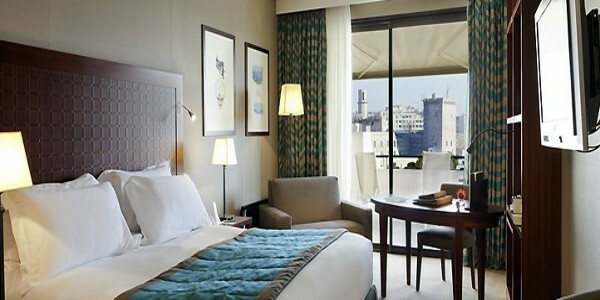 5-star hotel in Marseilles.The Sofitel Marseille Vieux Port hotel, known as “the best address in Marseilles” thanks to its unique view, is an ideal stopover a short distance from the Château d’If and the Calanques. The new decor of this luxury hotel is inspired by the history of Marseilles and the seafaring world – reminiscent of a sumptuous yacht on the Mediterranean. Be seduced by the magical views of the old port from the Le Carré lounge bar, the Les Trois Forts gourmet restaurant and the new So SPA. Bathed in light with views over the old port, and offering luxurious beauty treatments and high-tech facilities including hammam, sauna and relaxation pool. Closed Sunday afternoons. For information call +33 (0) 491155939. No children allowed. ​With views over the Pharo, the palace of Napoleon III, or over the Vieux Port, five rooms are available for prestigious seminars and meetings and three private dining rooms can host groups of 10 to 160 people. to let you combine fun, work and relaxation in the hotel’s exclusive atmosphere of luxury and comfort. All our services will be tailored to your specific requests. Room measuring 301 sq. ft. (28 m²) with a stylish and sophisticated decor, regular Internet and Wi-Fi, bathroom with a double bathtub or walk-in shower and tea and coffee making facilities. Elegant and stylish room measuring 323 sq. ft. (30 m²) with a view of the port, Wi-Fi, bathroom with double bathtub or walk-in shower screened by a glass wall, and tea and coffee making facilities. Elegant and stylish room measuring 377 sq. ft. (35 m²) with a large terrace overlooking the port, regular Internet and Wi-Fi, bathroom with shower and bathtub, and tea and coffee making facilities. 60 sqm 646 sq. ft. apartment with elegant and sophisticated decor, separate living room with TV, fax and WiFi, bathroom with large massage shower, bathtub and LCD TV, hi-fi, courtesy tray with tea and coffee, top floor, harbour view. 90 sqm 969 sq. ft. apartment, living room with TV, fax, WiFi, dining room that can be adapted for meetings, bathroom with massage shower, bathtub and LCD TV, dressing room, hi-fi, courtesy tray with tea and coffee, top floor, harbour view. Located on the 7th floor, the view from the Les Trois Forts gastronomic restaurant is simply magical. The chef, D. Frérard, a Master Chef of France, offers “haute couture” Mediterranean cuisine in a modern setting overlooking the sea. Booking recommended. In this “So Chic So Cool” atmosphere, enjoy Pata Negra (Iberian ham), a blue and white macaron with the flavors of the OM and never-before-seen creations from the barman. On the 3rd floor, the amazing view over the Vieux Port makes this the place to be.